1 of 5 Heat broiler. Coat broiler-pan rack with nonstick cooking spray. Toast bread. 2 of 5 Gently heat sauerkraut in small saucepan; drain. 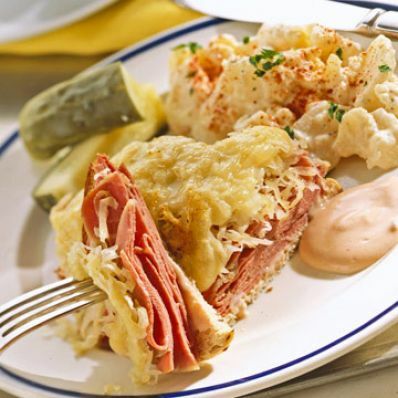 3 of 5 For open-faced sandwiches, spread each slice of bread with 1 tablespoon dressing; top each slice with corned beef, sauerkraut and cheese, dividing equally. 4 of 5 Broil sandwiches 4 to 6 inches from heat for 3 minutes or until tops are lightly browned. 5 of 5 Serve immediately with extra dressing on the side. Makes 4 sandwiches.